← Have you met Malaga’s sensational Phoenician Goddess? You might remember that towards the end of June last year, we had a large wildfire on the outskirts of my home village of Cómpeta. This event prompted me to write an article about what we should do about fire prevention and self protection in the event of a wildfire. 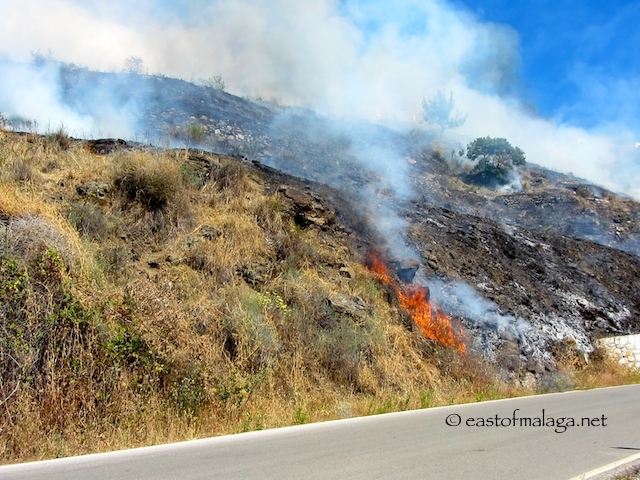 Yesterday afternoon, I was on my way home from Málaga when, just before the turn off to my house, I spotted a large plume of smoke, not far away. 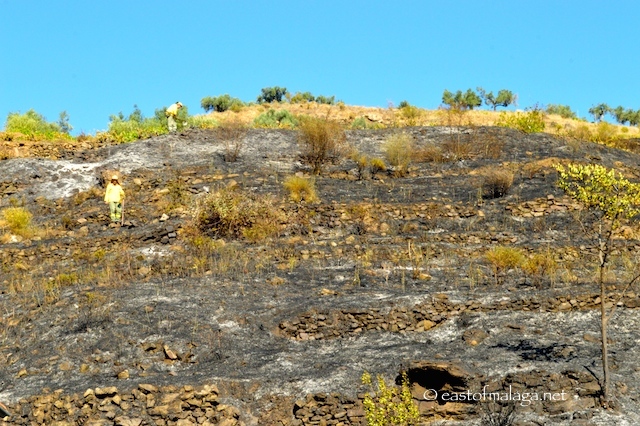 Instead of turning towards my home, I carried on up the road towards Cómpeta, and only about 750 metres further on came across a burning hillside. It was quite surreal as there was no-one else around, yet clearly it appeared that the fire had been burning for at least some minutes as the whole hillside looked to be alight. I drove past the fire, turned the car around and pulled to the side of the road to call the emergency services (the number to call in Europe is 112) to give the exact location of the fire. There was nothing else I could do, and I didn’t want my car being in the way of the emergency services, so I took this short video (only about 7 seconds) and then headed home to spread the word. The fire is not only by the side of the road, but look at the flare-up near the top right of the frame. After only a couple of minutes I had posted on Twitter and onto my own East of Málaga Facebook page, where I know that lots of local people follow me. Within no time at all, that post had reached 6,000 people and had been shared 40 times – with lots of comments tagging others to let them know. THAT’S THE POWER OF COMMUNITY and I am very proud of the community that has grown up around my East of Málaga blog. So I’d like to say a great big THANK YOU to each and every one of you and, to those who don’t follow my Facebook page , I’d like to invite you to “Like” the page, click on “Get Notifications” and join in with the community. I usually post a couple of times a day, and share many more photos over there. As for the fire – well, I went back a couple hours later – after the helicopter had left, and the fire appeared to be largely out, though the fire fighters were still there, doing their job. Well done, guys and THANK YOU! What’s YOUR experience of a community all pulling together for the good of others? 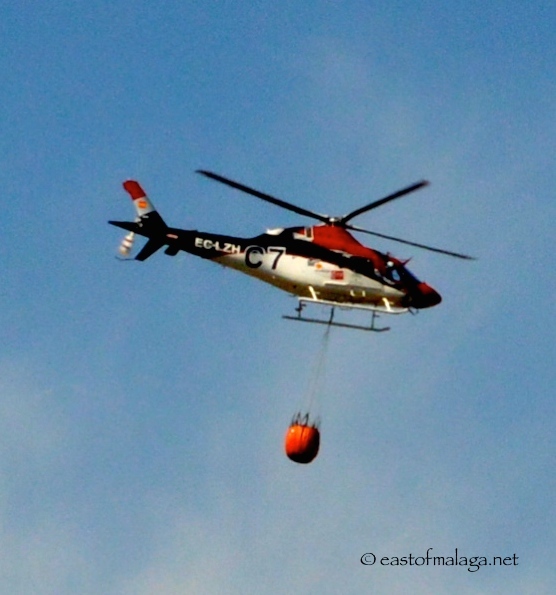 This entry was tagged Andalucía, Cómpeta, East of Malaga, Europe, Malaga, photography, Spain, Torrox, wildfires. Bookmark the permalink. Wonderful to read this Marianne. It does take a village… and our Social Media followers are definitely our own little village. Well done to you and your community. That would be soooooo scary to see a fire near your home. Amazing how fast Facebook can work. Maybe it’s time I got an account haha. Goodness Marianne I bet the house owners are glad you were around! Well done, that’s what community is all about.